It's always been a quirk of Cinebench that the overclocked single core results are lower than the stock ones and the B450 is no exception. In the multicore test, the top score and the one that really matters, the MSI sees a stunningly good result, finding itself in the bronze medal position and 0.2% behind the very best. That's quite nice that. Almost like B350 Strix "I am cheap but I look expensive" nice. Just as a "warning" so to speak - when you use a M.2 NVME drive it disables 2 of the SATA ports from functioning. This applies each time you use another M.2 slot, atleast it does on the AsRock build I just made for my work. Dual Samsung 970 NVMEs in Raid 1 and it causes me to lose 4 SATA connections. Which left me with 4 available SATA slots since the motherboard had 8 to start with. This would have happened regardless of RAID or not. This is just a warning as I said since if I used both M.2 slots on this MSI board I'd not have enough room SATA plug wise to get all the HDDs in place due to the M.2 use disabling one set (2) SATA slots each. 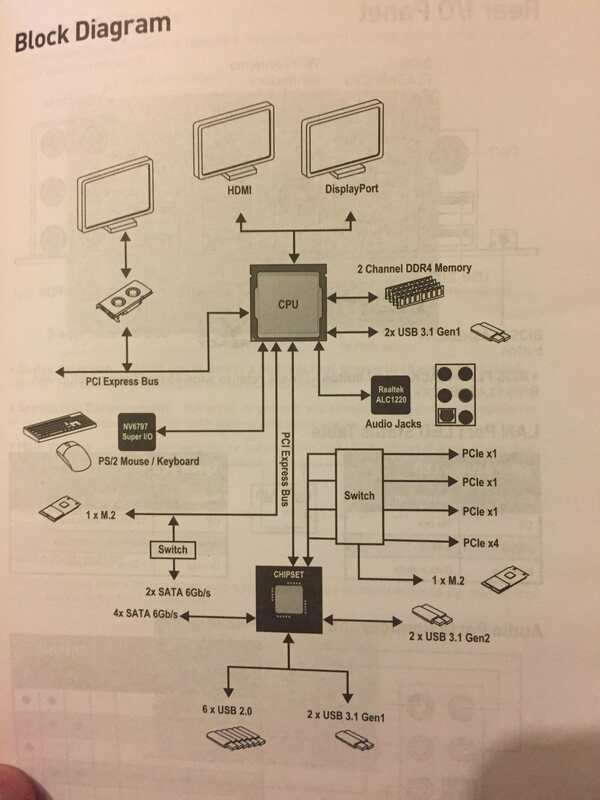 This is the block diagram from the user guide.